My friend Heather Powers has written a new book which is perfect to introduce to you during Polymer Clay Month! 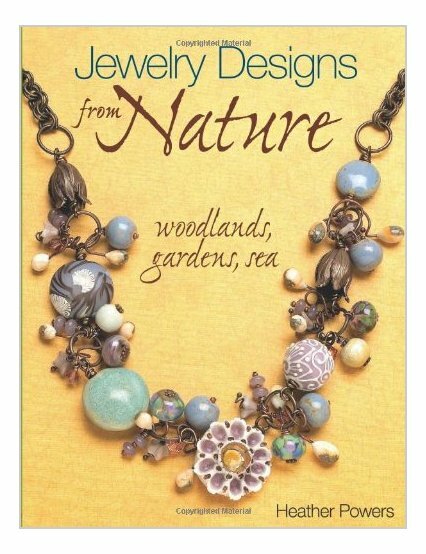 Jewelry Designs from Nature features gorgeous nature-inspired necklaces, bracelets, and earrings that Heather has designed in tribute to her beloved woodlands, flowers, fields, ponds, gardens, and seas. You will probably already be familiar with Heather's beautiful polymer clay beads, but perhaps you didn't know that she loves creating finished pieces as well. This book is not about making beads, but rather takes you deeply into the creative process that Heather employs as she gathers artist-made beads and finds a jewelry "home" for each. You won't have to worry about not having the exact same beads that Heather uses: she gives you extensive information on size and feel if you'd like to make your own (or just gather them at shows! ), and she also gives you contact information for the artists whose work she uses just in case you see a bead you can't live without. The pieces that Heather makes are lush, charming, balanced but asymmetrical, and totally unique. The feel of many pieces is rustic, which enables the student to chose base metals and less-expensive beads to mix in. We all know how difficult it's become to afford gold and even silver...well, these designs look best with brass, bronze, and copper anyway, so that makes me really really happy! Spent all summer creating with pearls and bronze, so would love to find this book for more inspiration for winter. Beautiful!